Venice California - 'Coney Island of the Pacific' history book. Venice California was 100 years old in 2005. To celebrate its centennial, historian Jeffrey Stanton has published a new and enlarged hardback edition of his photographic history book about Southern California's fabulous amusement resort that thrilled millions during the first half of the 20th century. Venice and adjoining Ocean Park in their heyday formed the nucleus of a gigantic amusement complex, the Disneyland of its day. Built to look like its namesake in Italy, many of its streets were canalled, its business district building’s colonnaded in Venetian style, and its huge amusement piers contained the latest in fun houses, roller coasters and other thrill rides. Los Angles' interurban trolley system transported 100,000 tourists to the beach resort each weekend, and Venice's miniature steam trains and gondola fleet, and electric trams along Ocean Front Walk provided its internal transportation. Its earlist piers, which succumbed to fire in the 1920's were replaced by modern piers; the Venice Amusment Pier (1921-1946), the Ocean Park Pier (1926-1956), and the remodeled Pacific Ocean Park (1958-1967), that residents of Los Angeles area Venice and Santa Monica fondly remember. Photographs of nearly every attraction are included in the book. 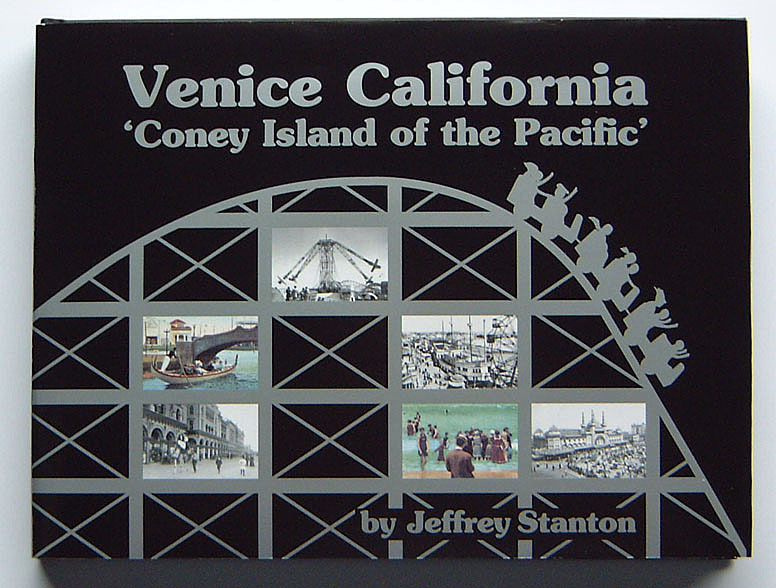 The author, Jeffrey Stanton, began collection photographs of Venice and its amusement piers in 1978. By 1987 his archive had grown to over 600 quality photographs of pier aerials, the resort’s amusement rides, its parades, canals and business district. 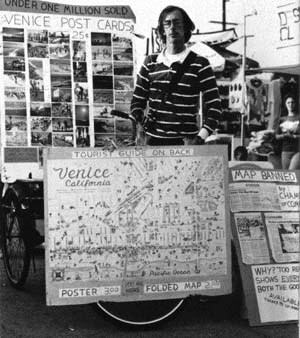 Years of reading the Venice Vanguard and Santa Monica Evening Outlook newspapers on microfilm enabled him to write an expanded text rich in the town’s unique history. He concentrated on the town’s amusement zone because it was the economic lifeblood of the town. Venice's success as both a town and resort came from its ability to attract millions of free spending tourists to its beach and amusement piers each year. The culmination of his effort was the publication of a 176 page, coffee table history book published as a trade paperback during the winter of 1987. The author's research and collecting of historic photographs and color antique postcards during the last two decades became a passion, and his private archive grew steadily during the last two decades. He obtained the finest and clearest photographs, many printed from the original 4 x 5 inch and 8 x 10 inch negatives, for this centennial edition of his book. Now after years of additional research including reading the entire Venice Vanguard, every column inch, and many decades of the Los Angeles Times including its real estate pages, and also the Parks and Outdoor Recreation pages of Billboard magazine, he was able to chronicle Venice's entire history of the resort's development and its amusement pier economy. He finally understood the motivation and financial aspects of real estate developer, Abbot Kinney's building of Venice and his stormy relationship with the town's businessmen. While he revised the first two chapters from 1891 to 1912, and added 56 additional pages and 90 additional photos, including the construction photos of the town, in his 1993 edition, it required several additional years to ferret out the missing events in Venice's history. The centennial edition's text is nearly twice as long, now 100,000 words. He was particularly aware that the events of the last 30 years were important to residents who lived in the community for a long time, and since the last chapter was likely to be the only one read and critized, the author interviewed many of its participants in an effort to get it right. The final chapter was expanded from 6 pages to 20 pages, with great emphasis on an expanded text, four times longer than in previous versions, and includes eight pages of the author's color photos that he personally photographed for his postcard company. 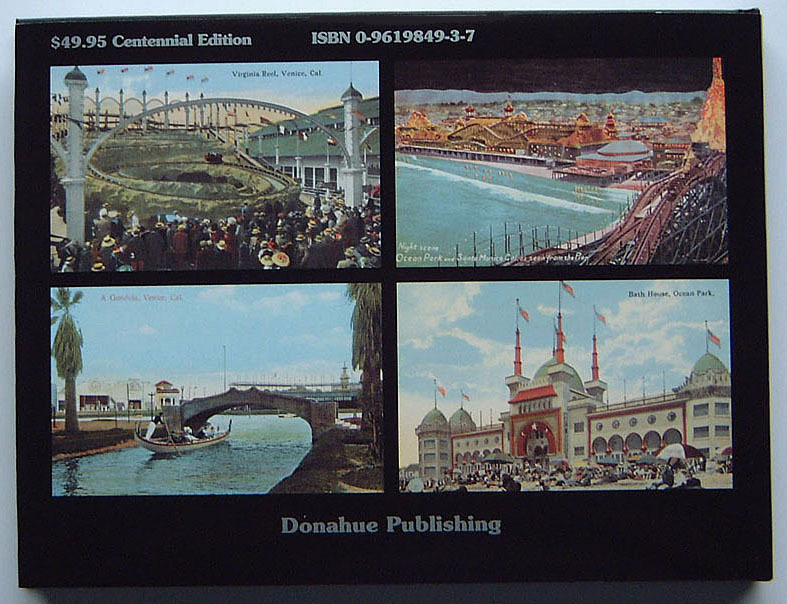 The result, as a whole, is an outstanding coffee table book that showcases Venice's unique history and brings many older resident's childhood memories back to life, including their visits to Venice's fabled Venice Amusement Pier (1921 - 1946), and Ocean Park's Lick and Ocean Park Piers (1926 - 1956) and its remodeled Pacific Ocean Park (1958 - 1967). Album style book - 12 inch long x 9 inch high. 288 pages (20 pages in color). Illustrated with 367 historic photos (62 new - not in previous editions). 26 pages of Pacific Ocean Park photos. Seven - 3/4 perspective aerial maps of piers & town. Venice California - 'Coney Island of the Pacific' can be ordered by mail from the author. Since the book is self-published, the book is unavailable from chains like Barnes and Nobles and Borders or Amazon (used copies sell from $75 - $200) , who believe that only large publishers can produce quality books. It is available from several independent new and used bookstores plus several gift stores in the Venice, Santa Monica and Mar Vista area, and nowhere else. Don't waste your local bookstore's time in trying to order the book, as the book is a limited printing with only local interest, and would be difficult to sell outside the area. I do not take bookstore special orders. Buyers will have to search hard, but those who desire an autograph copy and live nearby, can arrange to pick the book up from the author's home in south Mar Vista. It is only a half mile from the Centenial exit on the Marina Freeway. Call first, but there is no answering machine. (310) 821-2425. All books are shipped by United States Post Office - 4th Class Book Rate unless UPS is specified and extra shipping fees are paid. Jeffrey Stanton, author of these books, sells his own photographic postcards and history books on Venice Beach on weekend afternoons from a table on the beach side of Ocean Front Walk. NOTE: Jeff's table is currently closed because the Venice police don't interpete the current vending ordinance the way it is written that allows photographers to sell their own photos. He is threatened with heavy fines and arrest. He is also the author of eleven computer books (1981-1986) including two textbooks on arcade game design. He has two engineering degrees from Rensselaer Polytechnic Institute.